Because of the truth of God´s presence in us, we will never ever be moved. And no matter what circumstances we may be in or whatever may happen to this present world, our eternal life is assured and we could fulfill His divine purposes for His honor and glory. - Oviedo, Asturias (North of Spain) & Barcelona outreach: the Pastor´s conference last month gave Rey the opportunity to meet leaders and pastors interested to be part of the networking effort we have. The Pastor of the Oviedo church and the Barcelona church booked and opened new doors for workshops, campaigns and festivals. Lord willing MOVIDA festivals will also be set up in these places. - Dani´s evangelistic efforts: the friendship evangelism through HIPHOP dances has been instrumental for Dani to get in contact with the youths here in Madrid and Torrejon de Ardoz. Praise God for the first performance they did last month where he met key leaders and contacts. Please pray that his light may shine forth brightly as God´s testimony in this society particularly among the artists whom he associates with. He is training a youth group to evangelize on the 20th of this month during a special youths’ encounter in Torrejon. - “CIRCULARTE”: this is one of the activities being initiated by Christian Artists in Madrid to unite all the efforts being launched to evangelize Spain. Lord willing, Dani will represent ART Company in this event on March 19-21. Please pray that the Lord would confirm in his heart his role in reaching out to the Spanish youths through his artistic abilities. - European Conference in April: for the first time, this conference will be held here in Spain on April 15-18 in Valencia. Please pray that the Lord may grant favor among our working leaders to be permitted to attend this wonderful opportunity. - L.D.C. (leadership development course) liven up new leaders commitment: getting into preparations particularly doing the will of God in His services is not an easy task. Obstacles, trials and problems are part of it. The enemy is working really hard to discourage the students to keep on. Please back them up in your prayers. Together let us all claim God´s victory in each of their lives. Praise God for the inspiring testimonies of perseverance and determination they are experiencing. - Month of March weekend conferences: What a privilege to have with us Pastor John & Sis Shiela Fry (from UK, they are retired ministers now doing a missionary work linked with FIRE VISION ministry). They are here in Madrid for a month as main speakers in our weekend conferences ministering to our church leaders, to the ladies, families and new contacts being reached out through our home cell groups. Please pray that the power of the Holy Spirit may transform lives as they attend these activities. 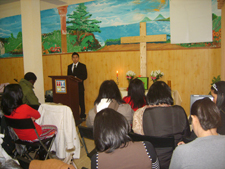 - Pastoral Prayer Breakfast: The work of the Lord is done through God´s power and divine intervention. Prayer moves the hand of God and we are convinced that being at the front line combat we ought to be much more focused in doing only His will and in the spirit of His love. Every Sunday morning at 10:00-11:00 am, leaders and members are invited to join the pastor´s prayer breakfast. Praise God for such a powerful weapon we have in Jesus, we are so sure that we are already on the winning side, Amen! - Entire family accepted the Lord in our home visitation ministry: being aware of all the recent calamities, earthquakes taking place, the chip of the cashless society, economic crisis, etc… only confirm one obvious thing - the signs of times. The questions of each one in light of the promise in 1 Thess. 4 got answered. The family surrendered their lives to the Lord, they all want to be with the rapture and be prepared for these last days. Please pray that the seed sown in their hearts may continue to grow and bear fruits. - Please pray with us for a big church building within the city of Madrid: we believe that there is no more time to waste. The urgency to train disciples and leaders should augment to raise up God´s armies in this generation and we need the adequate building to be used as our center of activities. May God´s provision flows through His people & that He may grant us wisdom as well to tap all these resources necessary. - Rey with all the church responsibilities, mission trips and outreaches with ART Company & FIRE Vision ministry. - Vivs for her pastoral care, discipleship and counseling ministry to new converts. - Dani for his youth ministry and outreaches through massive and friendship evangelism. Dani on a Sunday morning service preaching about love. Fellowship time after the service. Tessie (on stripes) & her family came to know the Lord.